This DTC is stored when the engine does not start even though the STA signal is input or when the engine takes a long time to start, and when the engine speed is low or the engine stalls just after the engine starts. It is necessary to check if the vehicle ran out of fuel before performing troubleshooting, as this DTC is also stored when there is engine starting trouble due to running out of fuel. The engine speed is below 500 rpm with the STA signal on for a certain amount of time (refer to the illustration below). After the engine starts (engine speed is 500 rpm or higher), the engine speed drops to 200 rpm or less within approximately 2 seconds. Refer to DTC P0351 for the ignition coil circuit (See page ). Refer to DTC P2195 for the air fuel ratio sensor circuit (See page ). Refer to DTC P0451 for the EVAP system circuit (See page ). In contrast to normal malfunction diagnosis for components, circuits and systems, DTC P1604 is used to determine the malfunctioning area from the problem symptoms and freeze frame data when the user mentions problems such as starting difficulty. As the DTC can be stored as a result of certain user actions, even if the DTC is output, if the customer makes no mention of problems, clear the DTC without performing any troubleshooting and return the vehicle to the customer. When the Data List item "Immobiliser Fuel Cut" is ON, the engine cannot be started. When confirming the freeze frame data, if there are multiple items related to the cause of the malfunction, perform troubleshooting for all related items. Try to start the vehicle under the conditions recorded in the freeze frame data which were present when the malfunction occurred. Confirm the data at this time and compare it with the freeze frame data. If the malfunction does not reoccur, carefully check the vehicle conditions from when the malfunction occurred using freeze frame data. If the same inspection or replacement procedure appears 2 times when performing an inspection procedure, it is not necessary to repeat the procedure the second time. (a) Freeze frame data exists, but the malfunction (starting difficulty) has not reoccurred and the malfunction conditions are unknown. (1) The engine speed recorded in the freeze frame data is 0 rpm (the engine does not crank). One of the following problems may be present: battery depletion, excess engine friction, a starter malfunction or a crankshaft position sensor malfunction. If the battery voltage is less than 6 V during cranking, there is a high probability that engine friction is abnormal. If the battery voltage drops to 5 V or less when starting the engine, the battery may be malfunctioning. If the battery voltage fluctuates while cranking the engine, it can be concluded that cranking is being performed. When the engine speed is 0 rpm, the crankshaft position sensor and/or an ECM may be malfunctioning. (2) All engine speeds recorded in the freeze frame data are between 60 and 250 rpm (the engine cranks but there is no combustion). If the engine speed is between 60 and 250 rpm (no initial combustion), there may be a wiring problem or a complete failure of an ignition or fuel system part. Due to an engine coolant temperature sensor malfunction, the fuel injection volume is extremely high or low and the engine may not be able to be started. (3) The engine speed recorded in the freeze frame data is 250 rpm or higher (the initial combustion and starter turn off timing is too late). If the engine speed is 250 rpm or higher (combustion occurs but the initial combustion and starter turnoff timing is too late), the fuel injection volume is often incorrect (too low or too high) and determining the cause of the malfunction is often difficult. Due to an engine coolant temperature sensor malfunction, the fuel injection volume is extremely high or low and engine starting trouble may occur. If Long FT #1 is incorrect, there may be a fuel supply problem due to the injectors or fuel pump being clogged, etc. If the engine cranking speed is too high, compression loss may have occurred due to carbon interfering with the valve operation. The engine does not crank. The starter is normal if a noise that indicates the starter pinion gear is extending is heard. The battery may be fully depleted or there may be excess engine friction. The engine cranking speed is abnormal. If the engine cranking speed is too high (for example, 300 rpm or higher with no combustion), compression loss may have occurred because carbon interfered with valve operation, etc. There is no initial combustion. If there is no initial combustion, there is probably a wiring problem or an ignition or fuel system part malfunction. The engine stalls after starter turn off. If the engine stalls after starter turn off, the air fuel ratio may be incorrect or the VVT may have a problem returning. The initial combustion and starter turn off occur late. If the initial combustion and starter turn off occur late, the fuel injection volume is probably incorrect (too low or too high). Causes of fuel system malfunctions according to conditions present at the time of the malfunction. When 2 to 3 minutes have elapsed after stopping the engine: Fuel pressure loss due to the pressure regulator failing to maintain the fuel pressure. When 15 to 120 minutes have elapsed after stopping the engine: Problem with injector fuel seal. When a long time has elapsed after stopping the engine: Pressure regulator is stuck open. *1: First combustion after cranking begins. *2: Condition when engine speed increases and starter can be turned off. (b) When the malfunction (starting difficulty) can be reproduced, or when malfunction conditions are known. After turning ignition switch off, waiting time may be required before disconnecting the cable from the negative (-) battery terminal. Therefore, make sure to read the disconnecting the cable from the negative (-) battery terminal notices before proceeding with work (See page ). (e) Read the DTCs and record the Freeze Frame Data. This freeze frame data shows the actual engine conditions when engine starting trouble occurred. 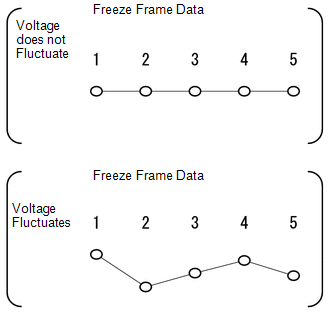 When confirming the freeze frame data, be sure to check all 5 data sets of freeze frame data. 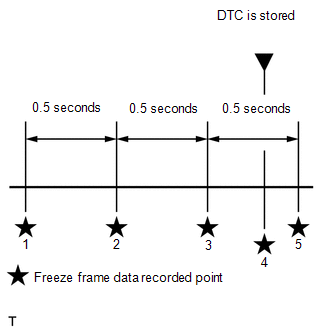 The fourth set of freeze frame data is the data recorded when then the DTC is stored. (d) Enter the following menus: Powertrain / Engine / Data List / Primary / Immobiliser Fuel Cut. If the engine is cranked immediately after reconnecting the battery cable (key verification for engine immobiliser system not completed), the engine cannot be started. Key verification needs to wait for several seconds after turning the ignition switch to ON. (a) Confirm the problem symptoms. When DTC P1604 is stored, either "Engine Start Hesitation"*1 or "Low Rev for Eng Start"*2 in the Freeze Frame Data will be ON. If "Low Rev for Eng Start" is ON, proceed to E.
*1: This value turns ON when the engine speed does not reach a certain value for a certain period of time when starting the engine. *2: This value turns ON when the engine stalls immediately after starting the engine. 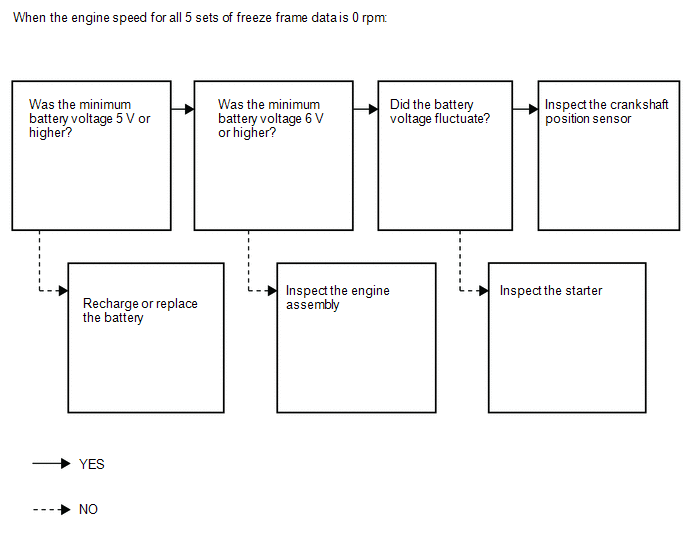 If "Low Rev for Eng Start" is ON, as there is a possibility that the low engine speed or engine stall was caused by the user, confirm the following freeze frame data items. 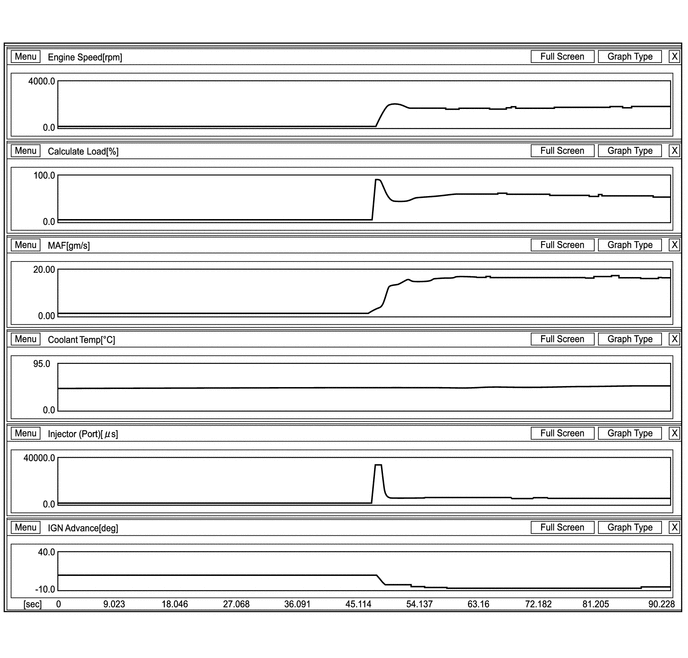 *1: The 5 sets of freeze frame data show approximately the same battery voltage. 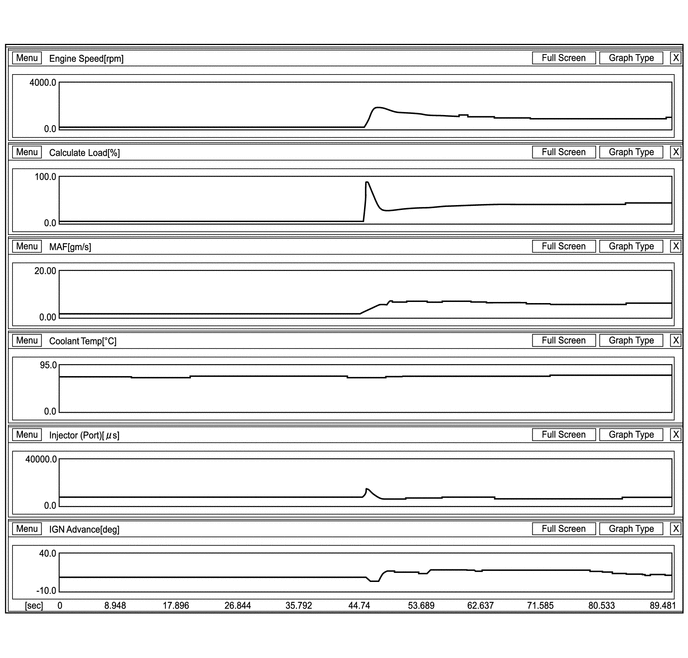 *2: The 5 sets of freeze frame data show different battery voltages. 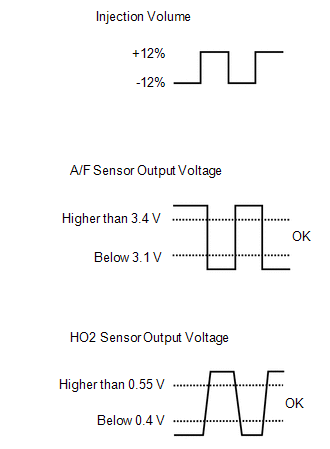 *3: If the voltage fluctuates, it can be determined that cranking is being performed. When the engine speed is 0 rpm, the crankshaft position sensor system and/or the ECM may be malfunctioning. *4: There may be excess engine friction. Make sure that the crankshaft rotates smoothly when turning it by hand. Excess engine friction may have occurred temporarily. Remove the cylinder head cover and oil pan, and check for foreign matter such as iron fragments. If there is a malfunction or signs of a malfunction present, perform a detailed inspection by disassembling all the parts. Perform "Inspection After Repair" after replacing the engine assembly (See page ). (a) Check the tightening and installation condition of the crankshaft position sensor bolt. (b) Check the connection of the crankshaft position sensor connector. (b) Check for oil on the connector terminals. No oil on the terminals. (a) Check the harnesses and connectors, referring to DTC P0335 inspection procedure (See page ). 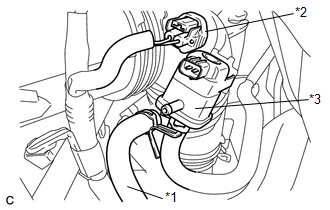 (a) Replace the crankshaft position sensor (See page ). (b) Check the engine start operation. Malfunction has been repaired successfully. *1: A long time had not elapsed after stopping the engine. *2: A long time had elapsed after stopping the engine. *3: Use an actual outside temperature estimated from the Initial Intake Air, Ambient Temp for A/C, and (if possible) the weather when the DTC was detected. (b) Disconnect the fuel pump connector. (e) Enter the following menus: Powertrain / Engine / Active Test / Control the Fuel Pump / Speed. (a) Check the harnesses and connectors, referring to DTC P0300 inspection procedure (See page ). (e) When performing the Active Test, check for fuel leakage from the fuel pipes. When performing the Active Test, if there is no operating noise from the fuel pump, the fuel pump system may be malfunctioning. Check if the vehicle ran out of fuel, as engine starting trouble due to running out of fuel is also detected. *1: Compression loss may have occurred in the engine assembly. *2: Use an actual outside temperature estimated from the Initial Intake Air, Ambient Temp for A/C, and (if possible) the weather when the DTC was detected. Perform "Inspection After Repair" after replacing the engine assembly or engine coolant temperature sensor (See page ). (a) Check that no carbon is stuck to the fuel injector assembly. *1: If the engine coolant temperature is 40°C [104°F] or less (after stopping the engine and the vehicle is not driven for a long period of time), the pressure regulator may be stuck open. Attach a fuel pressure gauge and check the ability to maintain fuel pressure after stopping the engine. *2: If the engine coolant temperature is 40 to 90°C [104 to 194°F] (15 to 120 minutes have passed after stopping the engine), there may be fuel leaking from a fuel injector. *3: If the engine coolant temperature is 90°C [194°F] or higher (2 to 5 minutes have passed after stopping the engine), there may be a problem with the pressure regulator failing to maintain the fuel pressure. Attach a fuel pressure gauge and check the ability to maintain fuel pressure after stopping the engine. For the fuel pressure inspection, refer to the following procedures (See page ). (a) Attach a fuel pressure gauge and check the fuel pressure after stopping the engine. If the engine cannot be started, read the values after cranking the engine. (a) Clean the inside of the surge tank with compressed air. (b) After stopping the engine, measure the HC concentration inside the surge tank for 15 minutes. If the concentration is 4000 ppm or higher, a fuel injector assembly may have a sealing problem. (a) Inspect the fuel injector assemblies (See page ). (a) Check if carbon is in the air flow passage. Perform "Inspection After Repair" after cleaning or replacing the throttle body assembly (See page ). (a) Check if the engine can be started. The problem symptoms below can be determined by reading the freeze frame data. If there is hesitation (cranking speed is slow and combustion occurs before passing TDC) during the initial cranking period, the battery charge may be insufficient or the starter may be malfunctioning. *1: If there is no initial combustion, a wire harness may be malfunctioning, or the ignition or fuel system may be malfunctioning. *2: If the engine stalls after starter turnoff, the air fuel ratio may be incorrect or the camshaft timing oil control valve may have a problem returning. *3: If the initial combustion and starter turnoff occur late, the fuel injection volume may be incorrect (too low or too high). (a) When cranking the engine, check for a noise indicating that the starter pinion gear is extending, and check that the starter pinion gear is not spinning freely. A noise indicating that the starter pinion gear is extending is heard but the starter pinion gear is spinning freely. *1: The battery may be fully depleted or there may be excess engine friction. (a) Inspect the battery (See page ). (a) Check that the crankshaft rotates smoothly when rotating it by hand. Excess engine friction may have occurred temporarily. Remove the cylinder head cover and oil pan, and check for foreign matter such as iron fragments. If there is a malfunction or signs of a malfunction present, perform a detailed inspection by disassembling all the parts. (b) Check for starter pinion gear wear and damage. There is no wear or damage. (a) Check the cranking speed. *1: If the cranking speed is fast, there may be compression loss. (a) Using a sound scope or screwdriver, check for an injector operating sound while cranking the engine. Fuel injector assembly operating sound is heard. (a) Check for sparks (See page ). (a) Confirm the conditions present when the malfunction occurred based on the customer problem analysis. *1: The pressure regulator may be stuck open. Attach a fuel pressure gauge and check the ability to maintain fuel pressure after stopping the engine. *2: Fuel may be leaking from a fuel injector assembly. *3: The pressure regulator may not be able to maintain the fuel pressure. Attach a fuel pressure gauge and check the ability to maintain fuel pressure after stopping the engine. 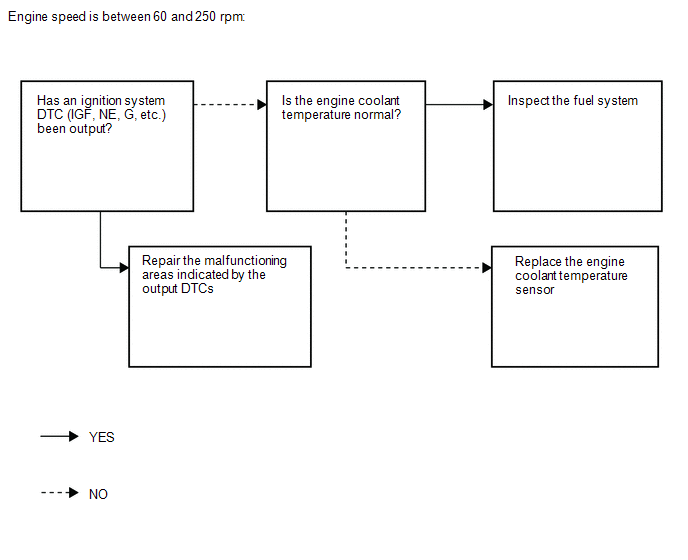 *4: From step 69, perform fuel system troubleshooting C (steps 70 to 74). 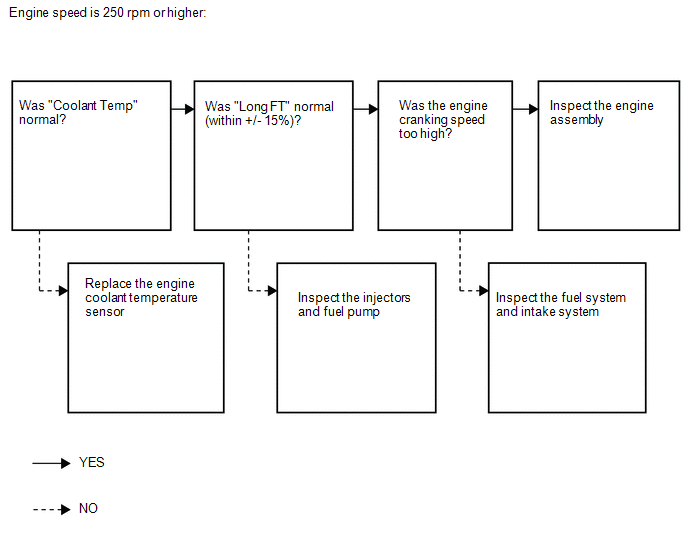 *1: from step 69, perform fuel system troubleshooting C (steps 70 to 74). If the concentration is 4000 ppm or higher, a fuel injector may have a sealing problem. (a) Inspect the spark plugs (See page ). Even if the spark plug of only one cylinder is malfunctioning, replace the spark plugs of all cylinders. (d) Enter the following menus: Powertrain / Engine / Data List / Primary / Engine Speed. (f) While running the engine, read the [Engine Speed] value. A value that matches the actual engine speed is constantly output. 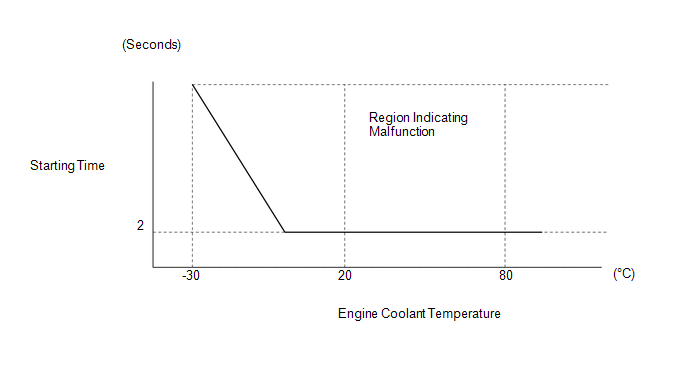 Check the engine speed using a line graph. If the engine cannot be started, check the engine speed while cranking the engine. If the engine speed is 0 rpm, the crankshaft position sensor may have an open or short circuit. (a) Check the harnesses and connectors, referring to DTC P0351 inspection procedure (See page ). If the wire harness is normal, after replacing the ignition coil assembly, check if engine starting trouble occurs again. If engine starting trouble occurs again, proceed to step 69 and perform troubleshooting for the ignition system (steps 75 to 83). Perform "Inspection After Repair" after replacing the ignition coil assembly (See page ). (c) Enter the following menus: Powertrain / Engine / Active Test / Control the Fuel Pump / Speed. (d) When performing the Active Test, check for an operating sound from the fuel pump. If there are no fuel leaks, after inspecting the fuel pump control system, check if engine starting trouble occurs again. If engine starting trouble occurs again, proceed to step 69 and perform fuel system troubleshooting C (steps 70 to 74). (a) Inspect the mass air flow meter sub-assembly (See page ). (a) Check for air leaks in the intake system (vacuum hose disconnection, cracks, damaged gaskets, etc.) (See page ). If the accelerator pedal is released after racing the engine, the inspection is easier to perform because the vacuum inside the intake manifold increases and the air suction noise becomes louder. If Short FT #1 and Long FT #1 are largely different from the normal values (differ by higher than 15%) when idling (intake air volume is small) and almost the same as the normal values when racing the engine (for example, when maintaining a speed of 3000 rpm) (intake air volume is high), air leakage may be present. There is no air leaks. (a) Disconnect the throttle body assembly connector. When the connector is disconnected, the vehicle enters fail-safe mode and the throttle valve opening angle is 4 to 7°. (b) Crank the engine and check that it starts. Perform "Inspection After Repair" after cleaning the throttle body assembly (See page ). *1: From step 69, perform intake system troubleshooting (steps 84 to 86). If engine starting trouble still occurs, perform fuel system troubleshooting A (steps 87 to 94). If the wire harness is normal, after replacing the mass air flow meter sub-assembly, check if engine starting trouble occurs again. If engine starting trouble occurs again, proceed to step 69 and perform intake system troubleshooting (steps 84 to 86). If engine starting trouble still occurs, perform fuel system troubleshooting A (steps 87 to 94). If the engine coolant temperature sensor is malfunctioning, after replacing it, check if engine starting trouble occurs again. If engine starting trouble occurs, replace the ECM. If engine starting trouble still occurs, proceed to step 69 and perform fuel system troubleshooting A (steps 95 to 102), fuel system troubleshooting B (steps 103 to 105), intake system troubleshooting (steps 106 to 108), and ignition system troubleshooting (steps 109 to 117), in that order. 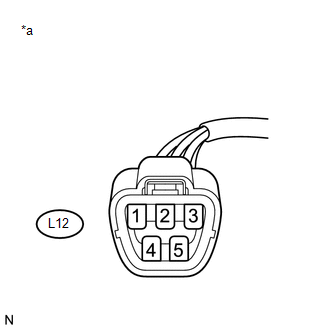 (a) Check the harnesses and connectors, referring to DTC P0115 inspection procedure (See page ). If the wire harness or connector is malfunctioning, after replacing or repairing it, check if engine starting trouble occurs again. If engine starting trouble occurs, replace the ECM. If engine starting trouble still occurs, proceed to step 69 and perform fuel system troubleshooting A (steps 95 to 102), fuel system troubleshooting B (steps 103 to 105), intake system troubleshooting (steps 106 to 108), and ignition system troubleshooting (steps 109 to 117), in that order. If the mass air flow meter sub-assembly is malfunctioning, after replacing it, check if engine starting trouble occurs again. If engine starting trouble occurs, replace the ECM. If engine starting trouble still occurs, proceed to step 69 and perform fuel system troubleshooting A (steps 95 to 102), fuel system troubleshooting B (steps 103 to 105), intake system troubleshooting (steps 106 to 108), and ignition system troubleshooting (steps 109 to 117), in that order. (d) Enter the following menus: Powertrain / Engine / Data List / Gas AF Control / Long FT #1 and Atmosphere Pressure. (d) Enter the following menus: Powertrain / Engine / Utility / Learning Value Reset. (e) Confirm the following conditions as instructed on the screen. (f) After confirming, select "Next" and initialize the learn value. If a message indicating learned value initialization failure is displayed on the screen, confirm the execution conditions, and perform learned value initialization again. (g) Check if the engine can be started. (d) Enter the following menus: Powertrain / Engine / Data List / Gas AF Control / Fuel System Status #1. (e) Confirm that Fuel System Status #1 is CL. (f) Enter the following menus: Powertrain / Engine / Data List / Gas AF Control / AF Lambda B1S1. (g) Confirm that AF Lambda B1S1 is within the range of 0.95 to 1.05 when idling. (h) Enter the following menus: Powertrain / Engine / Active Test / Control the Injection Volume / Gas AF Control / AFS Voltage B1S1 and O2S B1S2. (i) Read the output voltage from the air fuel ratio sensor when increasing and decreasing the fuel injection volume. If the air fuel ratio sensor is malfunctioning, after replacing it, check if engine starting trouble occurs again. If engine starting trouble occurs, replace the ECM. If engine starting trouble still occurs, proceed to step 69 and perform fuel system troubleshooting A (steps 95 to 102), fuel system troubleshooting B (steps 103 to 105), intake system troubleshooting (steps 106 to 108), and ignition system troubleshooting (steps 109 to 117), in that order. (a) Check if the idle speed is stable after starting the engine. After replacing the fuel injector assembly or mass air flow meter sub-assembly, check if engine starting trouble occurs again. If engine starting trouble occurs, replace the ECM. If engine starting trouble still occurs, proceed to step 69 and perform fuel system troubleshooting A (steps 95 to 102), fuel system troubleshooting B (steps 103 to 105), intake system troubleshooting (steps 106 to 108), and ignition system troubleshooting (steps 109 to 117), in that order. Perform "Inspection After Repair" after replacing the fuel injector assembly or mass air flow meter sub-assembly (See page ). *1: If one cylinder is abnormal, replace the spark plug of that cylinder and inspect the ignition and fuel system for that cylinder. After performing repairs, check if engine starting trouble occurs again. If engine starting trouble still occurs, proceed to step 69 and perform fuel system troubleshooting A (steps 95 to 102), fuel system troubleshooting B (steps 103 to 105), intake system troubleshooting (steps 106 to 108), and ignition system troubleshooting (steps 109 to 117), in that order. *2: If all cylinders are abnormal, replace the spark plugs of all cylinders and check if engine starting trouble occurs again. If engine starting trouble still occurs, proceed to step 69 and perform fuel system troubleshooting A (steps 95 to 102), fuel system troubleshooting B (steps 103 to 105), intake system troubleshooting (steps 106 to 108), and ignition system troubleshooting (steps 109 to 117), in that order. *3: Engine starting trouble may occur if the vehicle is driven extremely short distances repeatedly. *4: From step 69, perform fuel system troubleshooting A (steps 95 to 102), fuel system troubleshooting B (steps 103 to 105), intake system troubleshooting (steps 106 to 108), and ignition system troubleshooting (steps 109 to 117), in that order. *1: From step 69, perform fuel system troubleshooting A (steps 95 to 102), fuel system troubleshooting B (steps 103 to 105), intake system troubleshooting (steps 106 to 108), and ignition system troubleshooting (steps 109 to 117), in that order. If there are no fuel leaks, after inspecting the fuel pump control system, check if engine starting trouble occurs again. If engine starting trouble still occurs, proceed to step 69 and perform fuel system troubleshooting A (steps 95 to 102), fuel system troubleshooting B (steps 103 to 105), intake system troubleshooting (steps 106 to 108), and ignition system troubleshooting (steps 109 to 117), in that order. (a) If the malfunction could not be identified during the inspection in steps 38, 39, 40 and 46, perform fuel system troubleshooting C (steps 70 to 74). (b) If the malfunction could not be identified during the inspection in step 44, perform ignition system troubleshooting (steps 75 to 83). (c) If the malfunction could not be identified during the inspection in steps 53 and 54, perform intake air system troubleshooting (steps 84 to 86). If engine starting trouble still occurs, perform fuel system troubleshooting A (steps 87 to 94). (d) If the malfunction could not be identified during the inspection in steps 55, 56, 57, 58, 61, 62, 64, 65, 66, 67 and 68, perform fuel system troubleshooting A (steps 95 to 102), fuel system troubleshooting B (steps 103 to 105), intake air system troubleshooting (steps 106 to 108), and ignition system troubleshooting (steps 109 to 117), in that order. (a) Replace the camshaft position sensor (for intake camshaft) (See page ). (a) Check the tightening and installation condition of the camshaft position sensor (for intake camshaft) bolt. (b) Check the connection of the camshaft position sensor (for intake camshaft) connector. (a) Check the tightening and installation condition of the camshaft position sensor (for exhaust camshaft) bolt. (b) Check the connection of the camshaft position sensor (for exhaust camshaft) connector. (a) Check the harnesses and connectors, referring to DTC P0340 inspection procedure (See page ). (a) Check the harnesses and connectors, referring to DTC P0365 inspection procedure (See page ). (d) Enter the following menus: Powertrain / Engine / Data List / Primary / ISC Learning Valve. (e) Start the engine and warm it up until the engine coolant temperature stabilizes with the A/C switch and all the accessory switches off. (a) Check the compression (See page ). (a) Attach a fuel pressure gauge and check the fuel pressure when cranking the engine and after stopping the engine. (d) Enter the following menus: Powertrain / Engine / Data List / Gas AF Control / Long FT #1. (a) Check if the idle speed after starting the engine is currently stable and has always been stable in the past. Through the customer problem analysis, confirm the fuel being used and the location at which the fuel was added to check if the malfunction is caused by the fuel in the vehicle. Make sure there is no foreign matter such as iron particles on the fuel pump and no signs that the fuel pump was stuck. Make sure the internal connector is securely connected. Make sure the fuel pump filter is not clogged. (a) Disconnect the fuel vapor feed hose (on the canister side) of the purge VSV. (a) Check if carbon is on the intake valves.